Vietnam, a country reminiscent of a war-torn epic that rang of rock-and-roll, decadence, and destruction­ was, up until recently, visited by only the adventurous traveler. Though late in its arrival as a member of part of the Southeast Asian travel belt, today this crescent-shaped land with innate tropical beauty has attracted international appeal, leading to an influx of budget tourists and luxury travelers alike from across the globe. Cheap, tropical, mysteriously alluring — Vietnam’s climate provides the perfect beach vacation, while offering ample opportunity to peek down one of history’s infamous alleyways. Travelers will find a gamut of beaches dotting the coast including chill backpacker hangouts, luxurious resort getaways and sleepy fishing villages. 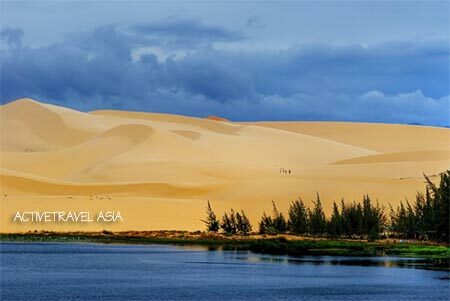 From Central Da Nang to the southern capital of Saigon — north to south — lie five beaches every traveler should check out in their quest for the perfect beach in Vietnam. Hoi An is an enclave of beautifully preserved yellow and blue buildings that makes you feel like you just stepped back in time into an 18th-century trading post. Sapphire waters lie on the other side of a 10-minute bike ride north through stagnant rice paddies, old French colonial villas, and the occasional propaganda billboard. The beachfront of the famed China Beach — the beach where soldiers were sent for R&R during the war — makes up the southern stretch. Recently named one of the most luxurious beaches in the world by Forbes, this white sand beach is home to comfy resorts and secluded swaths of sand. Hoi An, however, has much more to offer than just a beach. Declared a UNESCO world heritage site in 1999, this coastal village was once known as the premier trading post in Southeast Asia for the Chinese and Japanese. A bike ride around town takes you back to life in a small far-flung trading settlement. However, since the influx of visitors, shoppers are more likely to come across trinkets and “made-to-measure” one-day tailors than authentic goods. Market life is still prevalent next to the river where you will find fishermen paddling along in their boats, stirring up their catch of the day. For a sense of life before modern times, head into select buildings in the Old Quarter where you can view 200-year-old interiors that have been preserved for public viewing. If you decide to include Quy Nhon in your itinerary, expect to encounter only a trickle of foreigners stopping by on their way to Nha Trang. In a country besieged by tourism, Quy Nhon can truly be described as an authentic experience. Crowds of Vietnamese gather on the beach to play volleyball at sunset and offer hearty “hellos.” A few large hotels graze the southern beachfront, but since the Vietnamese aren’t keen to sunbathing, you’ll likely find the beach to yourself. A relatively small coastal city in Central Vietnam, Quy Nhon embodies a relaxed tempo not likely to be found in other Vietnamese cities. Grab a bike and slip along Nguyen Hue Road where a number of grins will greet you from people sitting in colorful plastic chairs. 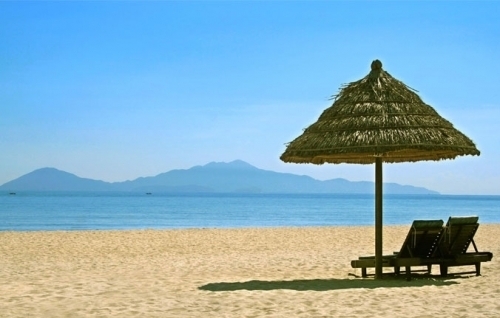 The longer you stay in Quy Nhon, the more you will appreciate the carefree lifestyle here. When I was there I stayed at Paradise Resort, a small, 25-bungalow resort run by Mr “Chere,” a French expat who has lived in Vietnam for over 20 years. You can rent a bungalow for the night, and the price includes three meals a day. The gregarious owner is very inviting and keen on getting all his guests to have a great time, making this resort seem more like a stay at a friend’s than a hotel. 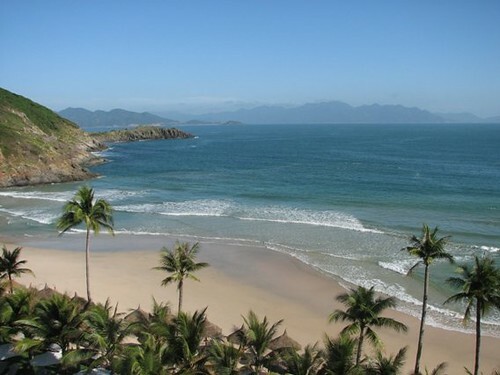 The resort is flanked by a small fishing village that proves an interesting excursion when not baking on the beach. During the midday you’ll find hawkers rocking in hammocks to escape the sun while children run a-muck between farm animals and the streets. Nha Trang has always been popular with the Vietnamese, but lately more and more backpackers and affluent travelers have been making their way here. The busy southern strip of the city is crammed with restaurants, SCUBA schools, and tour companies ready to take you out to sea and to one of the numerous islands scattered just off the coast. For those not ready to take the full plunge into the world of SCUBA, snorkeling is a great way to get intimate with the ecological kaleidoscope beneath the surface (and even copious amounts of alcohol found on the boat ride out). Mama Hahn’s Booze Cruise runs daily tours to four islands under the sails of their two lanky dinghies: the “lazy boat” and the “party boat.” Steadfast swimmers up for socializing with other international miscreants and an accompanying jovial Vietnamese guide should bee-line it to the party boat. As long as you stay buoyant and don’t swallow too much salt water, you’ll be sure to make it back to nurse that lingering hangover by nightfall. Don’t say you haven’t been warned. Though not easy, you can still find budget accommodations on the resort side of the beach for about $10-15, which is great considering that the backpacker side of the beach has lost nearly all its beachfront to erosion. A grey, impending concrete wall is now slammed by waves during high-tide leaving any idea of beach strictly to the imagination. There are a few bars and generic sit-downs here, and the low volume of traffic makes a motorbike tour up the 6-mile street safe and the best way to scope out the rest of what the area offer. The resort side of the beach, lying on the southern end of Mui Ne, still has its sand, and the restaurants and bars there enjoy a party atmosphere well into the night. Just remember, Vietnam is not nearly as rife as Southern Thailand when it comes to beach parties, bean bag chairs, and fire twirlers — not that you’ll miss any of those things when you’re here.